El Paso Ford was located at 415 Montana Street in El Paso , Texas. 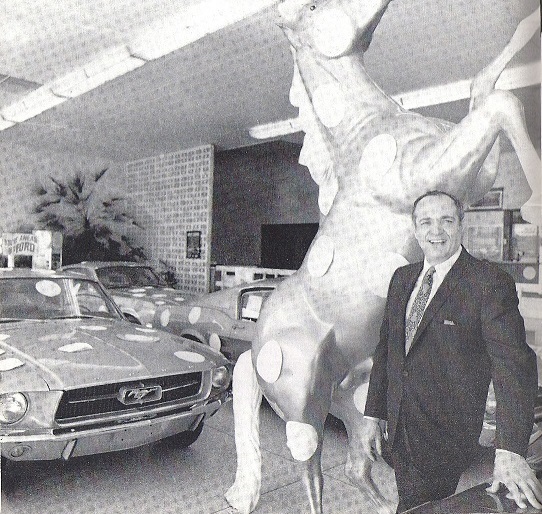 El Paso Ford, owner Russ Vento stands in front of a full sized polka dot horse during one of his promotions. 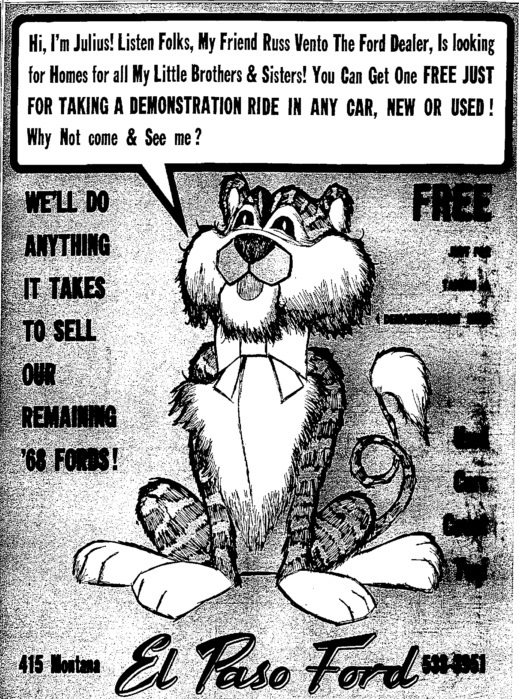 Julius the cat was the mascot of the dealership. 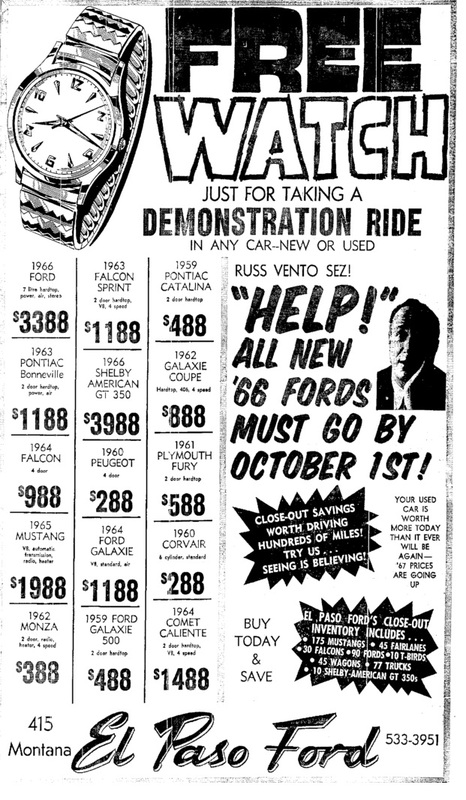 This ad is from September of 1966. El Paso Ford was famous for the stuff they gave away. These giveaways encouraged floor traffic. 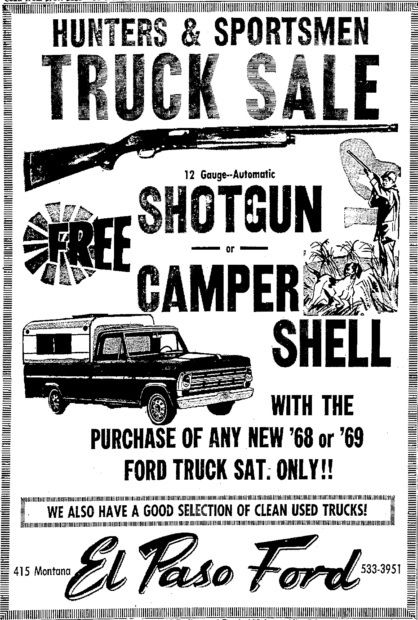 There is a 1966 Shelby for sale in this advertisement. 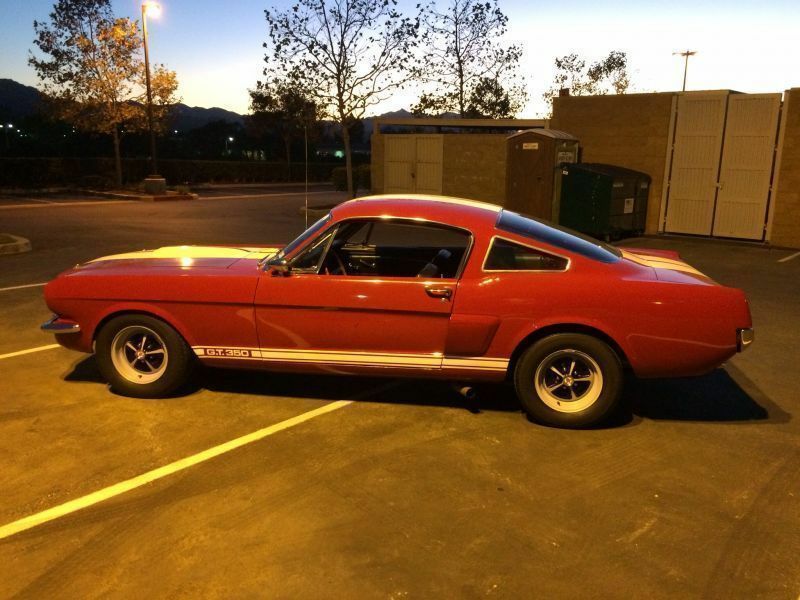 This beautiful, red 1966 is number 1117. It was sold new at El Paso Ford. I wonder how giving away shotguns would go over today? I found several promotions. These included turkeys, pumpkins, wigs, silver dollars, televisions, radios, cameras and playhouses! In March of 1968, Johnny Malone was still trying to sell 1967 Shelbys -CHEAP. 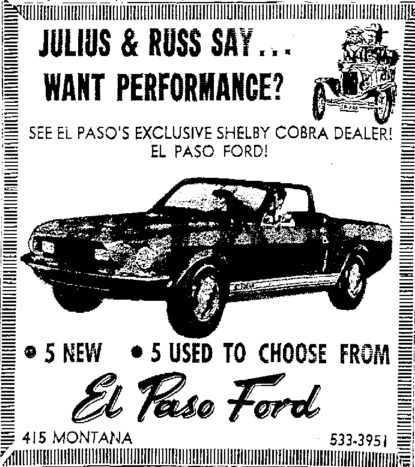 El Paso Ford sold a total 87 Shelbys between 1966-1969. During 1968 they sold 36 cars. 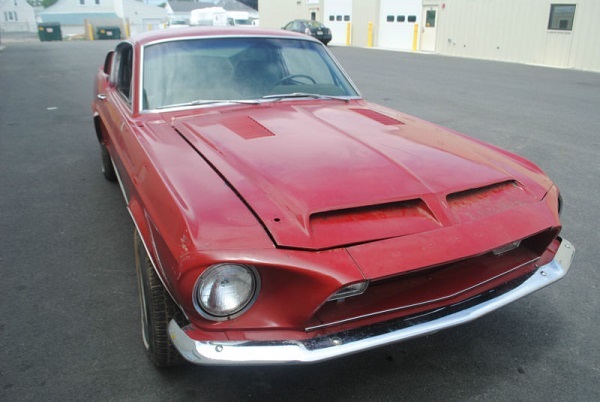 Serial Number 1592 was one of those 1968s. Like most cars sold by the dealership it has air conditioning. 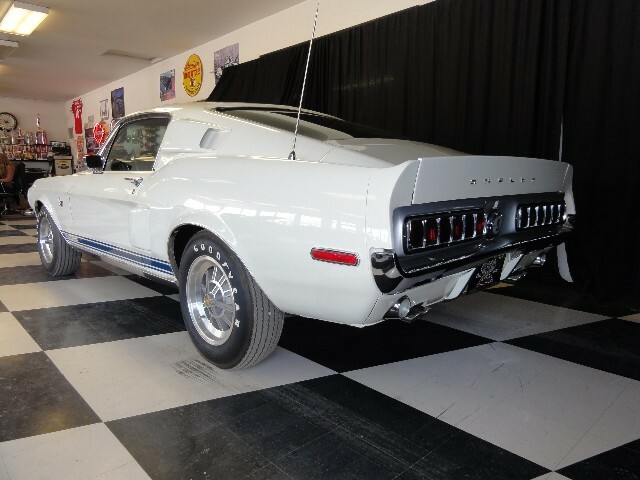 Serial Number 2813 was one of three GT500 KRs sold by the dealership. The dealership continued selling cars through the 1969 model year. 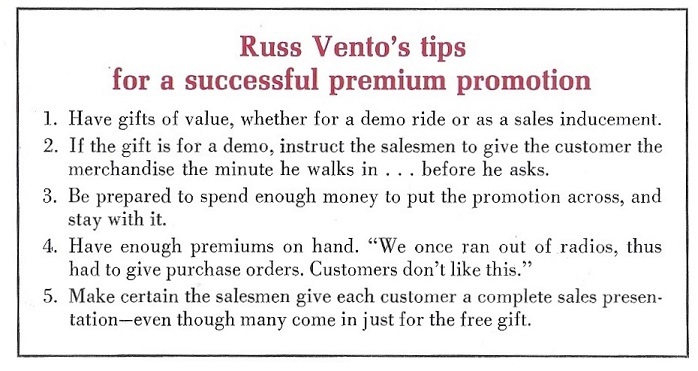 This original stationary is from the dealership. Take a look at the building on the bottom of the page. 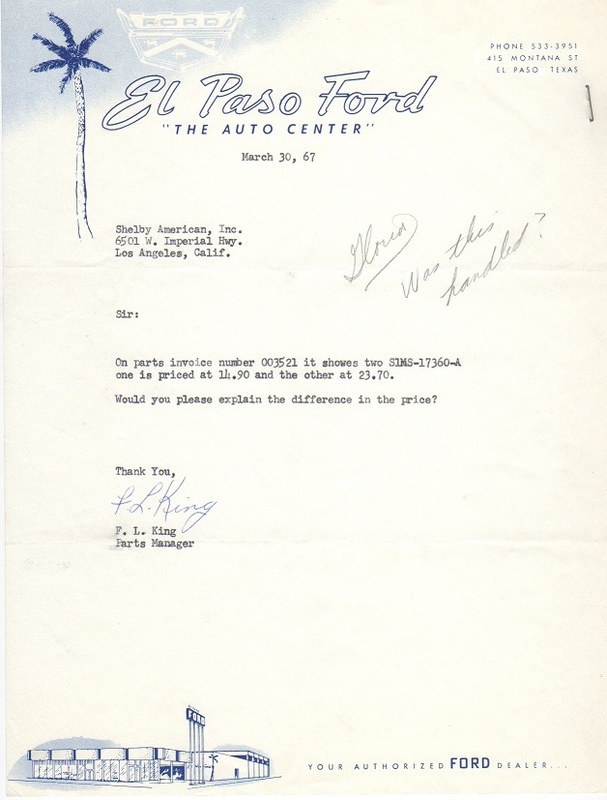 This original letter was sent to me by Vinny Liska, the 1968-70 Shelby Club Registrar. Vinny can help you research your car. After the dealership closed, the location became a jewelry store and now stands vacant. If you have anything associated with El Paso Ford, I would appreciate hearing from you.